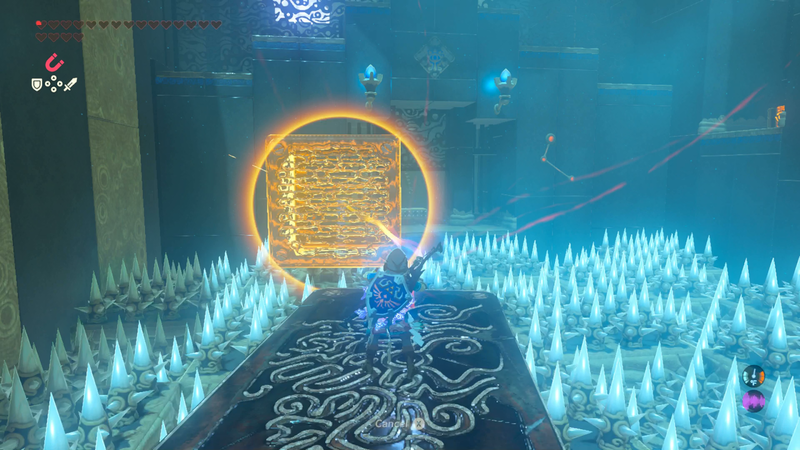 Breath of the Wild's shrines are unconventional puzzle boxes where players must do everything from guide balls through motion-controlled mazes to complete complex electrical circuits. The Champions' Ballad DLC introduces a dangerous gauntlet where a single misstep means death. At the start of The Champions' Ballad, Link receives a "one-hit obliterator", a weapon that allows him to defeat any monster with one hit but lowers his health to a quarter of a heart. A single mistake while holding the obliterator means death. Link must clear out camps of difficult enemies to reveal hidden shrines. Among these is Rohta Chigah shrine, a dangerous gauntlet of spikes that is equally absurd and wonderful. Rohta Chigah starts off relatively easy. 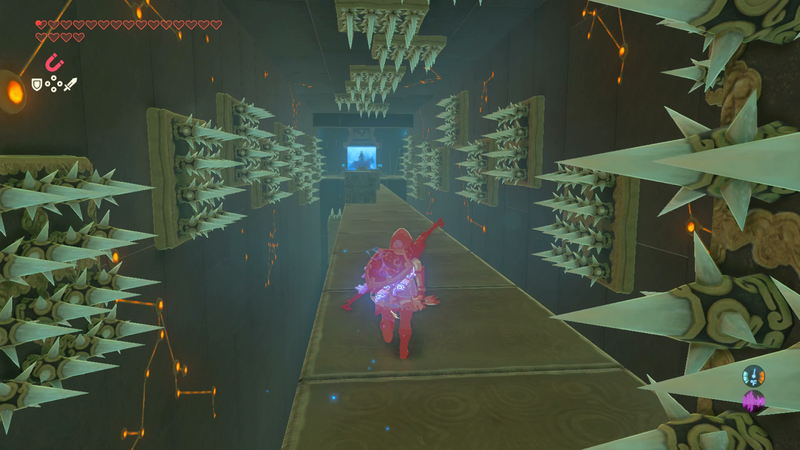 When Link enter the shrine, there's a spike-covered floor that shifts up and down as a mechanism raises and lowers certain floor tiles. The solution is clear: Link much use his magnesis rune to move a small collection of metal objects and create a bridge across the room. While the pulsing floor threatens to knock over the improvised bridge, the danger is largely illusory; the metal path tends to hold. But the threat of sudden failure sets a powerful mood that ramps up as challenges escalate. The next room is where the danger truly begins. It is a winding path of turning gears and conveyor belts flanked by spike walls. The gears push Link towards the spikes, making the room a frantic scramble. Link dashes and jumps from gear to gear. Sometimes, he is inches away from death. The shrine reaches a furious peak at the last section: A pair of alternating conveyor belts pushing towards either end of a small path with huge spikes. They move at a high speed that makes it difficult to simply sprint across. The ideal method is actual to jump from belt to belt, touching down for a moment and keeping a straight line. If that doesn't work, stasis will. Breath of the Wild puts a premium on movement with a vast open world that demands creative exploration and path finding. Rohta Chigah forces players to use what they have learned in a hyperfocused test of dexterity and speed. Rohta Chigah further emphasises smart movement with a massive pit with swinging spike balls that Link must glide across before a final segment where a wall of spikes pushes him down a path filled with spike-tipped columns that shoot out to block his path. I'm genuinely unsure of the intended solution; I bypassed the final spike column by using a shield jump to scale one side and leap towards the end. Shrines are often contemplative spaces where players are allowed to take their time to solve tricky brainteasers; some shrines are empty and offer rewards simply for discovering them. Rohta Chigah switches that up with its focus on obstacles and movement. A single misstep forces you to restart the entire shrine. Failure is punishing but success is well earned. There are over 120 shrines in Breath of the Wild and they end up forming one big blur. Rohta Chigah's challenges set it apart to make a truly memorable challenge. Are you kidding me? I found this one to be the most annoying hahaha. The last spike section I had a lot of trouble with because I kept trying to jump on top of that last horizontal one and Link would refuse to grab the ledge... I eventually got it though. No seriously, you misspelled Worst. I hated that shrine to the point where now I know I won't replay the game based on the thought of having to do it again. Thank the gods below it was in the DLC and not a main game shrine, or I would not have kept playing for fear of others like it.